‘The little port of Salem, in these thirty years between the Revolution and “Mr. Madison’s War” of 1812, was a powerhouse of world commerce. Seldom a day passed when a vessel did not clear for foreign ports or when some sharp-eyed boy did not come running to “King” Derby to collect a Spanish silver dollar for the news that a returning Salem ship stood off Baker’s Island. ‘The Revolution offered New England the greatest challenge of its maritime history. Salem’s response was a fleet of 158 privateers, some of them converted traders and some newly built, which issued from the port to prey on England’s commerce and carry naval warfare to the very shores of the British Isles. In 1781, the surrender of Cornwallis left Salem with a double problem. The privateers were built too large for the coastwise or the West Indian trade; and the British West Indian ports which had been open to Salem masters as colonials were closed to them as citizens of the new Republic. Casting about for new opportunities, the merchants fixed their gaze on the Orient, until then the exclusive trading province of the European East India companies. ‘Seldom, indeed, has Opportunity knocked so insistently on a boy’s door as it did in Essex County during the early years of the East India trade. 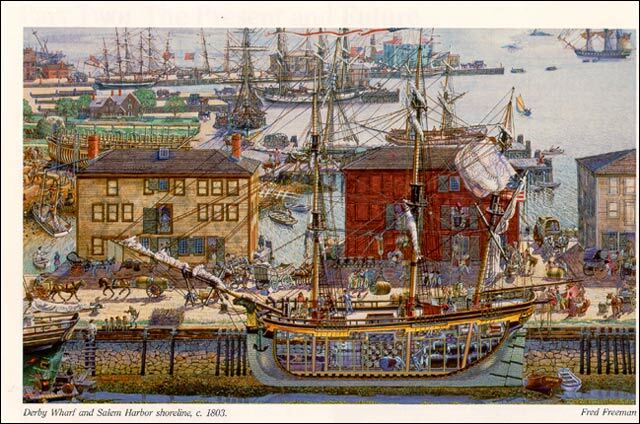 Though Salem in 1785 was the sixth largest city in the country (after New York, Philadelphia, Boston, Baltimore and Charleston), it still had only 6,665 people and in the main seafaring age group of sixteen to thirty it numbered but 694 males. ‘Except for the merchants’ sons, who went to Harvard, their schooling was sound but short. Nathaniel Bowditch, the great mathematician and navigator, had no formal schooling after he was ten and went to sea when he was fourteen. But these youths were men of the world when most of their compatriots were stuck behind a plow. Many a Salem boy had seen Calcutta and the Coromandel Coast before he ever set foot in Boston.